See? Not quite as bad against a clipped coat. Saturday, for the first time in my three years of owning Connor, I did a proper jump school without my trainer. I haven't up until this point, because for a long time, I felt like I didn't know enough about jumping to fix things if they went wrong (and they often do). But I am starting to trust myself over fences more lately. I know what needs work: my lower leg, his rhythm, his hind end engagement, his jumping across, my body awareness, and I can't expect my trainer to magically fix that once a week. So with the jumps set in the same configuration from Thursday's lesson (I just realized I deleted the post I was going to post about Thursday's lesson. It was fences at crazy and tight angles to each other, requiring straightness, precision and good geometry, at 2'6. 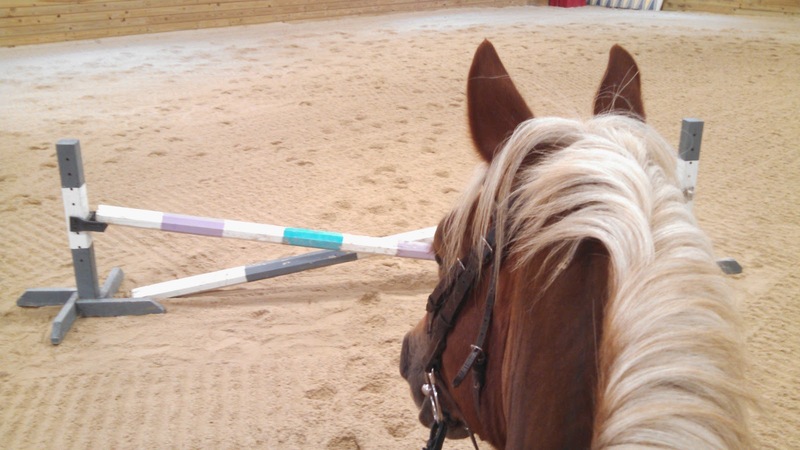 Meant to complement our last jump lesson, in which we wanted him to think faster without much regard for geometry. ), but lowered to pretty much cavaletti height, we got to work. I think I'm going to start a photo series called "How tall things look from Connor's back." You ever seen 2'9 from a 14.0hh horse's back? It's intimidating the first time! Anyway, this is proof that they were set for ameoba level. There's something to be said for just jumping thing over and over, fixing things as you go, sure, but just taking a million jumps. At this height, taking a bunch of jumps isn't an issue. 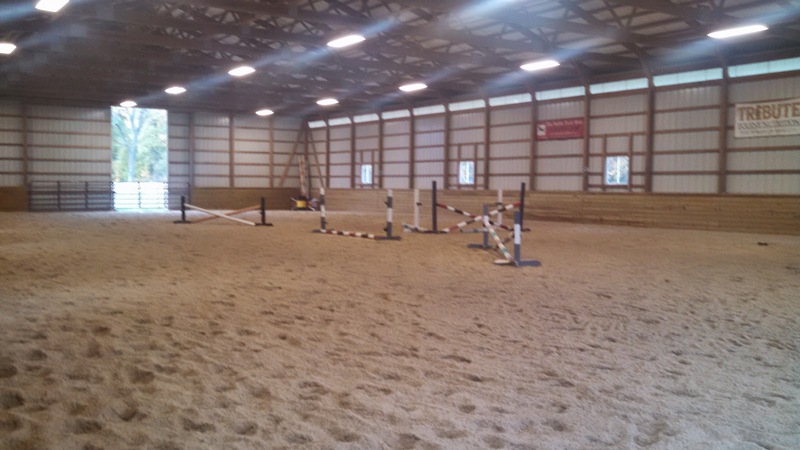 Thursday's lesson configuration, except for me the three jumps in the foreground were 2'6 verticals and the back X was a 2'3 oxer with a smallish spread. - Thanks to 2pointober, I raised my stirrups a hole just to see what would happen, and my lower leg is a lot more stable. - I realized he was taking long spots in the beginning and asked him to kindly not leave out that stride thank you very much, and he obliged. - When I rode asking for a lead on the other side of the fence, I got it every time. - He's started putting in really quick simple changes of his own volition on the other side of the fence if he knows he landed wrong. This is the best, because it means the exercises we've been doing to get him to think quickly and for himself are working. Fun! Yay for awesome jump schools! Agreed about jump height as well, I set some up in the ring for someone else to use and they looked fine,and even smaller than what I was good with on Checkers...then I got on Bridget! It sounds like a very productive ride. I'm glad all of the extra two point is helping. 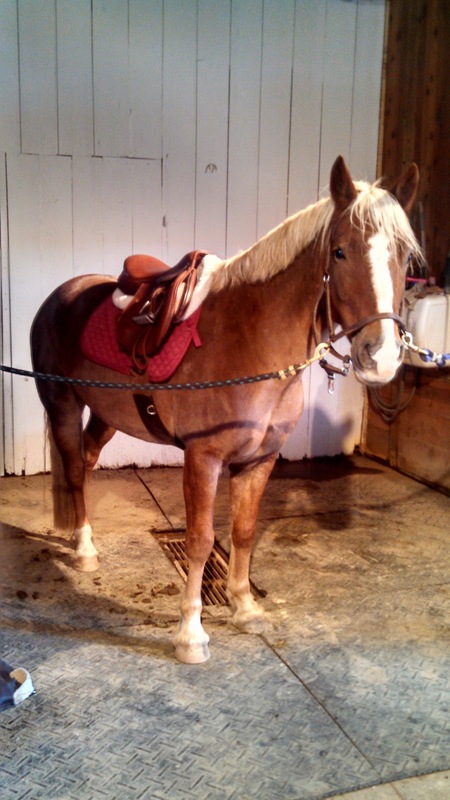 2'9 on a 14hh pony would look huge to me, at the moment it looks pretty big on a 15.3hh haha! Ha! I jumped 2'9" on a haffie once and it looked MASSIVE. Mad respect there.